Legions Rare. Akroma, Angel of Wrath is what many would call a “kitchen sink” card. What we have here is a 6/6 body with half the creature keywords of that era planted on her. Due to her evasive beatstickishness (that’s a word now), she was a monster in standard not once, but twice, when they brought her back as a Time Spiral, time-shifted card. She was even so popular that when it came time to design color-shifted cards for Planar Chaos, they jumped Akroma straight to the front of the line! And thus, Akroma, Angel of Fury was born! 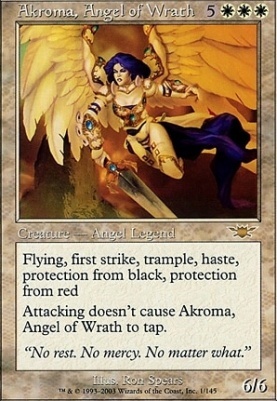 Not only was the coming of this card the first time a single character was represented by two cards in the same block, but our furious angel here is the ONLY mono-red angel in the game today. You’ll also note that this red Akroma seems to have picked up where her counterpart left off with many of her keywords. Here’s part of your lore tidbit for today (mainly because I find this one more interesting than most). In the story of Onslaught block, the Wizard, Ixidor, was a pit fighter who lost not only his biggest fight, but also his wife to Phage (who may or may not be a featured card down the line). After suffering this terrible loss, Ixidor wandered the desert in his grief. He honed his illusion powers and somehow, miraculously, created Akroma as an avatar of his righteous wrath, with the face of his lost wife no less (The man had some sentimental style that I can appreciate). 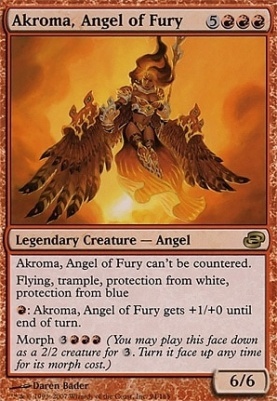 Like most of the color-shifted cards from Planar Chaos, Akroma, Angel of Fury was a sign of how things could have changed if events unfolded slightly differently. In a world where Ixidor’s grief turned into blind rage as opposed to a desire for justice, a very different sort of angel would have been made manifest.